I realize that some jams require a certain amount of sugar for the fruit to 'set,' which is one of the nice things about making fruit butter—there's no setting to worry about. You just let the fruit purée cook down until it's the thickness you desire. There are numerous methods for making pear butter, most of which I find to be unnecessarily complicated. My simple version comes via the inimitable Cookiecrumb, who blogs at I'm Mad and I Eat and probably turned to making pear butter out of desperation, since one of her backyard pear trees literally produces hundreds of pounds of pears a year. — Peel and core your pears. — Fill up a sink with dirty pots and pans. — Boil your fruit in water to cook it and then pour that flavor- and nutrient-filled water out. — Babysit a simmering pot on the stove for hours, stirring every few minutes so that it doesn't scorch. — Use anywhere near a cup of sugar per each cup of fruit. —Tell the lucky eaters of your fabulous homemade pear butter how little effort it actually took to make it. You will need a food mill (these are so handy) and about two and a half hours of oven time, though the total hands-on work is maybe 20 minutes. You will also need very ripe pears—the riper they are, the sweeter they are. And as you can see in the photos below, bruised and battered specimens (which are also the secret to my scrumptious 100% Whole Grain Ginger Pear Bran Muffins) work fine. If you have some slightly firmer pears, you might want to set aside enough to make an Easy Pear and Apple Crisp—or two. If you taste pear butter without knowing what it is, you might mistake it for apple butter. After making both, though, I find pear butter to be sweeter and more flavorful, as well as easier to make. Sad looking but oh, so sweet. It doesn't get much faster than this. I took Cookiecrumb's instructions and streamlined them even more—skipping the peeling and coring (by using very soft fruit) and putting in only about a third of the sugar. I bet you could even leave it out entirely. If you have trouble getting your pears through the food mill because they aren't soft enough, you can always peel and core them first. I used a classic Foley food mill (as seen in these photos) and it worked fine, but I'm just looking for an excuse to order I've since upgraded to an Oxo Good Grips food mill and love it. It isn't that much more expensive than the Foley and has three different grinding discs along with several other nifty features (Do you have one of these? Please let me know if you love it! Update: Thanks for all your helpful feedback!). If you don't have a food mill, you can press the peeled and cored pears through a sieve, but it'll probably take a while. Just don't use a food processor or you'll end up with liquid. You can gussy up your pear butter in all sorts of ways (several suggestions are below), but I think the plain stuff is divine. Serve it on muffins or toast, or even spread between layers of a cake. My favorite way to enjoy it (besides straight from the jar) is on top of organic Triscuit-style crackers and thinly sliced sharp cheddar cheese with a chilled glass of crisp white wine. Cooking time will vary depending on the juiciness of your pears, the size of your pan, and the thickness of pear butter you desire. As Cookiecrumb puts it, "Pull it out when you like the way it looks," keeping in mind that it will thicken slightly as it cools. I like mine on the thick side and sometimes let it cook as long as three hours, but of course that means I end up with less. For this size batch, I use a 3-quart oblong CorningWare dish. When doubling or tripling the recipe, a large stainless steel roasting pan—another kitchen favorite—works great. You can process jars of pear butter in a water bath canner, but it will keep unprocessed in the refrigerator for at least a couple of weeks. Unfortunately pears are high on the Environmental Working Group's list of most contaminated produce, so I recommend seeking out organic pears for this recipe. 1. Heat the oven to 300°. 2. Cut the pears into large chunks, removing any real bad spots (no need to peel and core unless your pears aren't very soft). 3. Press the pears through a food mill into a large bowl, remembering to reverse the direction of the handle after every few turns. You should end up with about 4 cups of smooth pear purée. 4. Stir in the lemon juice and sugar. 5. Pour the purée into a nonreactive (stainless steel, ceramic, or enamel coated) pan, such as a 3-quart CorningWare oblong dish (or a large stainless steel roasting pan for larger batches) and let it cook, stirring every 30 minutes with a wooden spoon, until it is the desired thickness, about 2 to 2½ hours. Start taste testing after 1½ hours. Remember that it will thicken slightly as it cools. 6. Let the pear butter cool and store it in an airtight dish or jar in the refrigerator. Alternatively, ladle it into clean and hot pint or half-pint canning jars, leaving ¼-inch headspace, adjust the two-piece caps, and process 10 minutes in a waterbath canner according to the manufacturer's instructions. © FarmgirlFare.com, the fruit-filled foodie farm blog where eating pear butter for breakfast, lunch, and dinner is indeed possible, though not encouraged, as it makes the pear butter disappear far too quickly! I HAVE the OXO food mill, and it is absolutely brilliant! We got it on the cheap at a going-out-of-business Linens and Things, and it has been worth its weight in gold. Spring for it!! This looks lovely. And another suggestion for gussying it up--star anise, removed after cooking. It does wonders for poached pears, so why not pear butter? I almost made pear butter last year, when our big pear tree went nuts and I almost drowned in pears. Then this year I got maybe a quarter that number of pears, so I didn't have an excess to worry about. Maybe next year. Perfect timing, I just came into the house with basket fulls of pears. Pear butter it is! Since becoming diabetic, I had no idea how many products use sugar as a main ingredient! How about an immersion blender? I use an immersion blender for my apple butter. I'll have to wait until next year for pear butter; I buy my pears at the farmers market. Wonderful recipe. I'm saving it now. I am flattered, and I am SO with you on reducing the sugar. Thanks so much for this! I have just recieved a ton of pears from my mother in law's tree and was about to start researching when this post arrived in my reader! I love your blog and all of your recipes! I dehydrated my pears- sweet, keep forever (not that they would last), no sugar. I use this tool to make applesauce and pear sauce. Works fabulous. My grandma used to make the most devine apple butter. I was just talking to my children about it. Unfortunately I think her recipe died with her years ago (she always had her own). This looks and sounds heavenly and has my mouth watering. I hope I bite off the nerve to try it soon. I use my crockpot for all fruit butters (lots of apple butter, apple-peach butter, apple-cranberry butter, and peach butter so far this year). I chuck the fruit in the crockpot and cook the bejeebies out of it. Then run it through the food mill and continue cooking the puree in the crockpot. Since I'm down South, I appreciate that it doesn't heat up the entire house (like a stove) and I don't have to monitor it continuously like I would if it was on the stovetop. I too have the OXO food mill - I love it. Actually I find it a breeze to clean, although sometimes the grating side of the disks can be a pain. My only complaint with it is that the angle of the turning disc (where the food gets shunted under and forced through the mill) seems low. I'd like to be able to do a bigger batch size. Of course, I haven't used any other food mill, so this could be standard. Other that the one caveat, I've found it brilliant for tomato sauce, apple butter, sieving raspberry seeds, and a number of projects. Well, I'm definitely going to have to jot down this recipe somewhere! We always have more pears off our trees than I can keep up with. I was over in Missouri (vacation) during your cool "frost" nights of October -- seems like October and November weather got switched around here in the midwest this year! Pear butter is a rare treat, but now that I have a box of pears burning a hole on my back porch, and your recipe in hand, it's suddenly become just what this cook ordered. Thanks for sharing. this was delicious!! thank you so much!! I had 13 red pears that were too soft to eat and it made one jar (not sure what size - I just used an old pickle jar) of pear butter... It tastes soooo good. Thanks for this recipe. Reminds me of apple season here in Wisconsin. My friends and I get together with our "tons" of apples and make applesauce...jar after jar! So much fun! I really do enjoy it. I tried a variant with the crock pot on low for overnight after the food mill. I also used brown sugar (1/3 cup) and a dash of vanilla. I think it came out just great. The pears were moonglows that grow on the tree out in front of my house here in Virginia. Small tree, plenty of fruit some years! Thanks for passing along the recipe. Oh, and mine looks more like apple butter, more russet toned . . . but could be any number of things from the pear variety to more caramelizing in the crock pot. 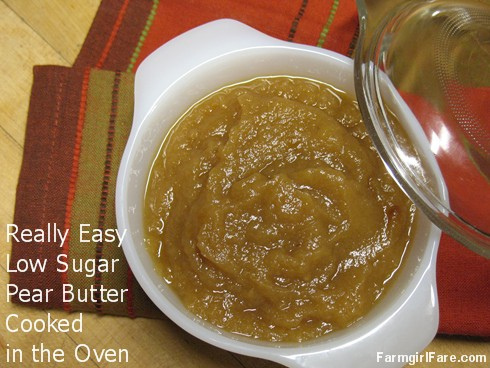 I am going to use this pear butter recipe tomorrow to homeschool my 4 girls. What is the shelf life of canning it? I think your sitr is great. What a fun school project! If properly processed and sealed, your jars of pear butter should safely last a year if stored in a cool, dark place. Remember to inspect all jars before opening: be sure the 'seal' button hasn't popped up on the lid; look for any seepage outside the jar, or mold inside the jar. Some darkening is normal, but if anything about the pear butter (looks or smell) is suspect, toss it out. Canning is a very safe, very wonderful way to preserve food, but it's always good to be careful. Hi there! I'm a new canner, innundated with pears, and haven't found anything in my proper canning books that looks as good as this. Is the sugar ratio not an essential element in making the butter safe to can? I have already made a bunch of pear sauce, so I was going to start with that, and the ratios won't be exact. Some recipes I've seen have OJ and lemon juice in them (but they also start with weight of raw pears). I think I only sort of understand the chemistry here and don't want to mess up... Any insight appreciated! The amount of sugar doesn't have to do with the safety of the finished canned product. It's safe to can homemade applesauce that consists of nothing more than apples. It's the acidity that's important, and apples and pears (and most fruits) are plenty acidic on their own. You can always add a little lemon juice to increase the acidity if you're concerned. After you've processed your jars in a water bath canner, check to make sure they've sealed properly - the little 'button' on the top of the lid should be down. If you press on it, you shouldn't hear popping sound. Gently try to pry the lid off the jar to make sure it's on there nice and tight. Sometimes the jars won't seal until a few minutes after coming out of the water bath, and you'll actually hear that button pop down and seal. If you're still concerned about the safety of the pear butter (or anything else), simply skip the canning process and store it in the refrigerator. Pear butter will last for weeks unprocessed. If you have a jar that didn't seal properly in the canner, just put it in the fridge and enjoy it soon. I got a great deal on overripe pears from my local grocer (he sold me 10# for $1!) and I was thinking of trying pear butter. Boy, am I glad I did! Absolutely outstanding recipe! Thanks for posting it! I love a good apple butter and now get to try what appears to be a great (and easy) pear butter. This makes me look forward to toast again! The kids love climbing up and getting the pears. I have NEVER canned anything But my husband asked me to do something with the 20lbs of pears we got the other day. I gave 10lbs away just because I didn't know what to do with them. Then I typed in Pear recipes and came across Your blog/site! Thank you for your wonderful recipe! LOVE your blog/site!!! I'm making pear butter as we (I) speak. So grateful for the "low sugar, fast cooking" recipe. I decided to cook in at the recommended 300 degrees in my roaster oven so as not to heat up my kitchen. I just turned the oven on and am going to transfer the pear butter-to-be to a glass dish and finish in the oven. It's just not reducing much after 2 and a half hours in the roaster. Bad idea I guess but no crockpot for me. Toooo long! i just made it... it was Amazing. I added a few spices to my liking . but it was amazing.. haha and easy!! If you do can it, how long does it last? The sugar in most jam recipes is a preservative, so I'm concerned that without it, you'll have an issue? If you can jars of this low sugar pear butter using a water bath canner, they should last at least a year if stored in a cool, dry place. The canning process is what makes preserves the pear butter so that it is shelf stable, not the sugar. For example, you can safely can applesauce made without any sugar. Love this pear butter. I have made it for three years. I sub honey for sugar and add cinnimon. We have had it keep for a year, the lemon juice is the presertive plus the natural acid in pears. I have a type one diabetic child and are always looking for healthy treats. This is good to bake with, serve over oatmeal, or as a side with pork. And of course toast! Thanks for the feedback - so glad you're enjoying the recipe. I love the idea of stirring pear butter into oatmeal. I'll definitely have to try it! I made a batch of pear butter yesterday, after picking about 15 pounds of pears from a neighborhood pear tree the day before. The pears were very sweet but crisp, so after slicing them up (and discarding the wormy parts), I steamed them before milling. By the time all 15 pounds had been steamed, the water in the steamer was concentrated pear sirup, just slightly caramelized. One problem with using crisp pears is that the sauce, after milling, has lots of little crunchy bits in it. So, I strained the sauce; a soup ladle makes a good pestle for forcing the sauce through a sieve and scraping the pomace out after each ladlefull is pressed through. I saw no need to add sugar, it was so sweet, but I did add the slightly caramelized sirup from the bottom of the steamer -- nothing in my final product there that wasn't in my pears to start with. I got about one cup of pear butter from 3 pounds of rather small pears. One thing I've done the pear butter and apple butter I've made is use them as cookie filling. It caramelizes a bit in baking, but when you bite into the cookies, they give you a burst of apple or pear flavor. I bought pears on sale for 78 cents a pound. Cheap fruit I thought. Five different varieties. Of course I will eat them. After a couple of days, I started looking around for an alternative. I found your web page and the pear butter recipe. I made pear sauce in the crock pot and was worried because even with the spices it was bland. But, soldiering ahead as instructed, I poured it into a glass baking dish in a slow oven and stirred occasionally. FANTASTIC. And the easiest thing I've ever done. Plus so little sugar it is cheap to make and fairly guilt free. So I did my first ever water bath canning and that was incredibly easy as well. Your recipe and instructions don't need nerves OR confidence or any particular skill and you feel like POWER COOK when you are done . . . and the house smells fantastic. Thanks.